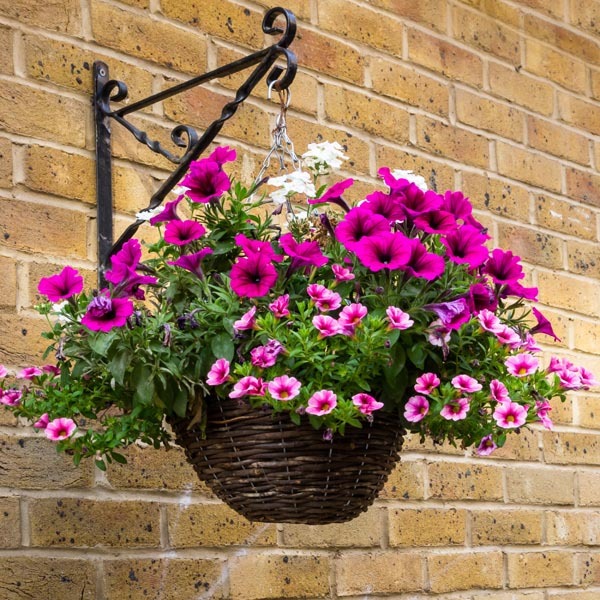 Flowering baskets offer a way to instantly increase gardening space by taking advantage of vertical space. They add eye-level color and bring small spaces such as balconies and porches to life. Hang from a shepherd hook in the landscape to add height and a structural dimension. Perfect for adding instant color to any location! They may be used to liven porches and patios. Fertilize regularly for best display. Water as needed to keep soil evenly moist, especially in hot weather. Fertilize regularly for best display. 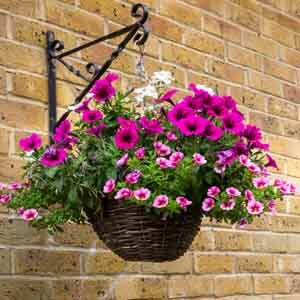 Prepare the container by filling with potting soil up to 2” (5cm) from the rim of the planter. Remove the plant from its pot or pack. If plants are in a pack, gently squeeze the outside of the individual plant cell while tipping container to the side. If plant doesn't loosen, continue pressing on the outside of the container while gently grasping the base of the plant and tugging carefully so as not to crush or break the stem until the plant is released. If the plant is in a pot, gently grasp the base of the plant, tip it sideways and tap the outside of the pot to loosen. Rotate the container and continue to tap, loosening the soil until the plant pulls smoothly from the pot. Make a small hole in the soil slightly larger than the root ball either by hand or using a trowel. Insert the plant into the hole and press soil firmly around the roots and just covering the root ball. When all the plants are potted, water thoroughly to settle the soil and give plants a good start. Plan ahead for plants that get tall and require staking or support cages. It's best to install cages at planting time, before the foliage gets bushy. Vining plants require vertical space to grow, so provide a small trellis that allows the plant to grow freely and spread. Some plants are grown only for their attractive foliage (such as coleus, dusty miller and flowering kale). The flowers are not particularly attractive so any buds that appear should be pinched off to keep the foliage looking its best.